Both Venezuela and Bolivia have come out to reject a new narcotics report from the U.S. State Department and Washington’s attempt to impose its drug policy of “double standards” on the South American countries, arguing that in contrast to the failed U.S. war on drugs, other nations are genuinely committed to the fight against illicit drug trafficking. Venezuela’s Foreign Ministry slammed the report — titled “International Narcotics Control Strategy 2017” and drawn up by the U.S. State Department — as illegitimate on March 4th, arguing that it violates fundamental principles of international law, such as non-intervention in internal affairs. “The failed ‘war on drugs’ deployed by the United States of America beyond its borders has only served to expand warmongering and interventionist policies that massively violate the human rights of entire populations in [sic] increase both the production and trafficking of drugs and the legitimation of assets derived from this crime,” the Foreign Ministry statement continued. 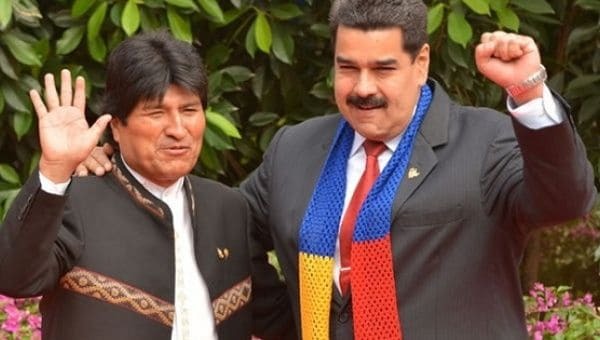 Bolivian President Evo Morales, visiting Cuba for medical treatment, took to Twitter March 3rd to condemn the report, saying that Venezuela and Bolivia will continue to stand up to U.S. imperialism and noting his country’s strides in combating illicit coca production under his government. “The only demonstrable failure is that of the U.S.: Bolivia and Venezuela are sovereign states and not submissive to empire,” Morales continued. Although the Bolivian government has decriminalized coca use within its own borders, coca is still considered illegal at the international level, meaning the South American country — where coca has a long traditional history of being used to combat the effects of altitude — continues to be stigmatized and criminalized internationally. In response to the sanctions against the vice president, Venezuelan Foreign Minister Delcy Rodriguez has stressed that Venezuela has increased its annual rate of drug confiscation since cutting ties with the U.S. Drug enforcement Agency in 2005. Next articleDomestic Terrorists Killed His Son. He Wants Trump to Remember that America Makes Extremists, too.